This one will be at the shop for several months on display (and kits are available!) so I may have to make another to use in the meantime! I love the sense of accomplishment with these smaller projects. My quilts tend to be large and involved, so it takes a while to get to completion. How about you, have you made any bags? Any other smaller projects you like to do to get that sense of a “finish”, more often? Cute bag. Love the colors and fabrics. I also need that sense of accomplishment now and then with smaller projects that are done quickly. I made a couple doll quilts at Christmas for our granddaughter and her cousin, and I'm working a smaller cheddar + crackers quilt that's showing up on several blogs here and there. Finishing a wall hanging or a table runner in the middle of work on larger projects gives me a “tah-dah” feeling that I need periodically. 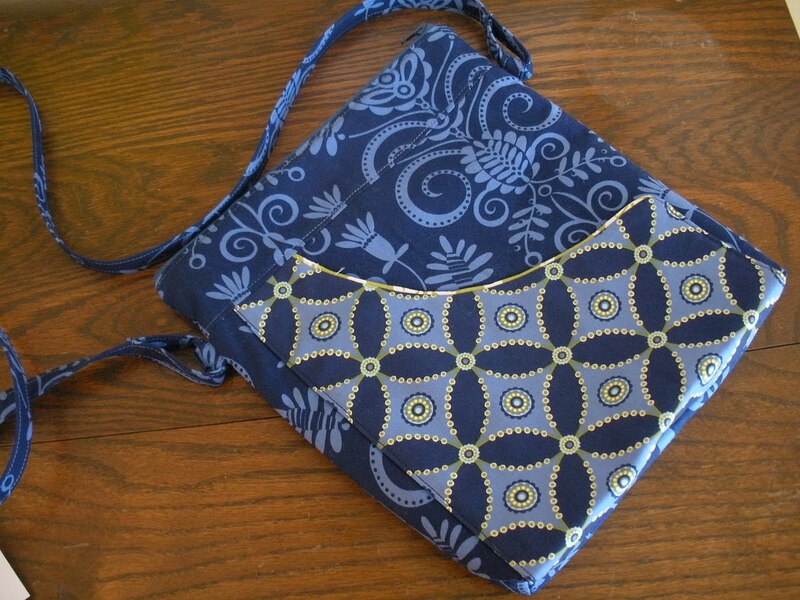 This is a great bag pattern. I like it for two reasons. First, my bags MUST zip closed at the top. I've heard enough warnings about pickpockets grabbing the contents of open bags that I want to be sure the stuff inside is protected. 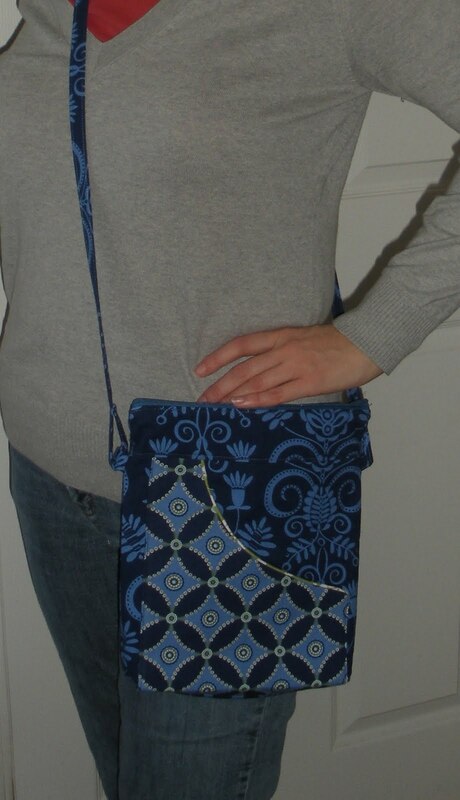 And second, I like that it has inside and outside pockets. Your fabric selection is great too. I'm not a “kit” person though – never have and never will buy one. I want what I make to be original. Even if it's a pattern others have made, I want to make mine look unique. That said, is the pattern available as a separate purchase? Okay, THAT is a really great little bag. I love the fabrics! That is a cool and stylish bag! 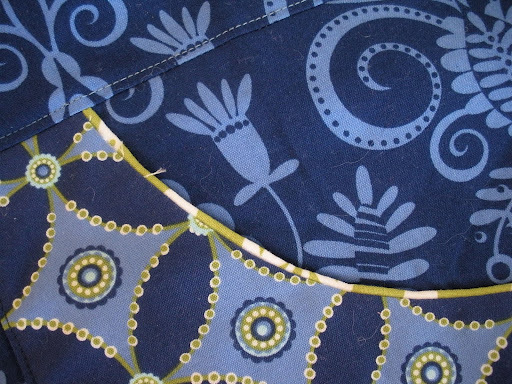 I love the use of piping and that outside pocket. 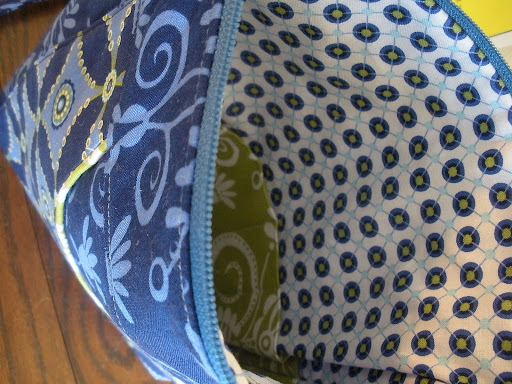 Bags are my favorite sewing project because of the variety and the time commitment. I also making mini quilts because they are a small project and fast finish.